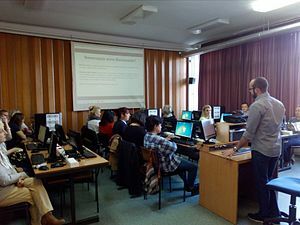 Accredited seminars for teachers are organized by Wikimedia Serbia within the educational program. This type of seminars represent the part of compulsory professional development of teachers that is prescribed in the Republic of Serbia by the Law on the basis of the education system. Through these seminars, teachers collect credits that are necessary for obtaining and renewing a license for teachers. Seminars are promoted and monitored by the Institute for the Improvement of education, founded by the Government of the Republic of Serbia. According to Serbian law, in 5 years each teacher needs to collect 120 points for compulsory professional development (24 points per year). Our seminar is one-day seminar, lasts 8 hours and has 8 points. Seminars are limited to 30 participants. Our seminar is titled "Application of online wiki tools in teaching and learning". It is accredited by the Institute for Advancement of Education (State Institute for professional development of the teachers) for a period of three school years: 2018/2019, 2019/20 and 2020/2021. The aim of the seminar is to bring together free educational tools and platforms for learning and raising the competencies of teachers for their use in teaching. An accredited seminar organized by Wikimedia Serbia in the school years 2016/2017 and 2017/2018 was called "Application of online wiki tools as a didactic tools in teaching and learning" and in 2014/2015 and 2015/2016 was titled "Application of online Wiki encyclopaedia in Serbian language in teaching". Our seminar "Application of online wiki tools in teaching and learning" is made for teachers of general and vocational subjects in High schools and secondary vocational schools as well as teachers of elementary schools. The practical part involves acquiring knowledge and developing skills for creating new or editing existing articles on Wikipedia. More information on the seminar can be found in the catalog, under catalog number 440 (competence K2, priorities: 3). After the seminar, the participants receive a certificate of training and further support from Wikimedia Serbia for the realization in practice. The seminar is free of charge for all participants. Please check each announcement for the exact details in Serbian. Photos from our seminars are availabe on Wikimedia Commons. For any additional information, please contact us by email seminari@vikimedija.org or by the seminar coordinator's phone number +381607454771 (Nebojša Ratković). Ова страница је последњи пут измењена 8. фебруар 2019. у 10:31.